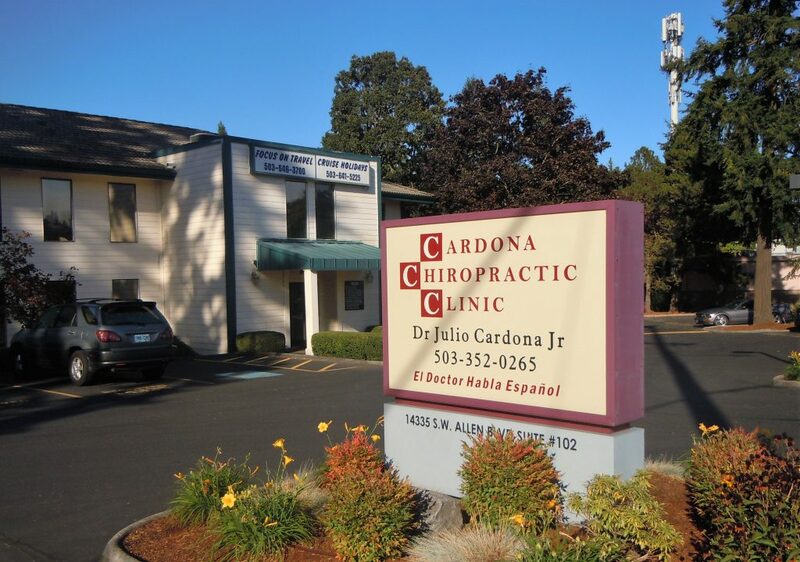 Cardona Chiropractic Clinic was established in 2008 in response to a need it’s founder, Dr. Julio Cardona Jr., chiropractic physician, saw in providing comprehensive care to the residents of the Portland, Oregon, metro region. Dr. Cardona’s philosophy is to provide the best possible and most comprehensive care to patients with musculo-skeletal injury and / or pain arising from an injury, regardless of the cause (motor vehicle accident, work injury, home injury). Our approach is quite simply to provide all patients with quality care, in a friendly and serene environment, coupled with expertise and compassion. Dr. Cardona’s years of dedicated experience in musculo-skeletal health care has made us number one in the filed of injuries and accidents. Our staff stands ready, able and willing to attend to all patients needs efficiently. Our office takes every task seriously and pays attention to all details. Our reports and records are unmatched and of the highest quality. Dr. Cardona regularly attends continuing education/certification programs to further enhance his abilities and knowledge in order to provide the best care. We gladly accept referrals and follow up with timely reports and comprehensive updates. Our large network of multiple contacts allows Dr. Cardona to make needed referrals to appropriate specialist. Dr. Cardona will always place the patient’s well being first and should Dr. Cardona find a case that is not responding to chiropractic care or need another specialist, Dr. Cardona will make the appropriate referral. Each patient, after comprehensive examinations, is carefully given a complete report of findings outlining each step of care. Concise and specific notes are precisely kept and recorded to meet all med-legal requests as well as satisfying any insurance requirements. Our insurance billing department is dedicated to treat all patients with honesty and integrity. Our management team is able to accommodate most patient’s demands without ever jeopardizing the quality and reliability or our services. Our long standing tradition of treating all patients with compassion, kindness and understanding, while using expertise and knowledge has made our clinic the premier in musculo-skeletal injury care. Our expertise has made us the most sought after injury and accident experts. A well-trained staff of friendly professionals is our trademark. Every aspect of care, from beginning to end, is covered by our clinic. Bilingual employees, including Dr. Cardona, are available to allow for treatment of a greater segment of the Portland Metro population. If you have any questions about how we can get you out of pain (or just make you feel a lot better), don’t hesitate to contact us today at (503) 352-0265.